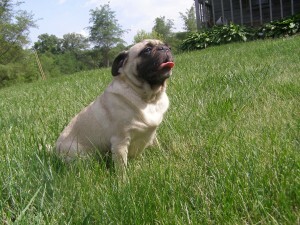 Foster home update – She is quite possibly the cutest pug we have ever fostered. She is very timid and sweet — comes wagging up to you when you walk in the door, but flinches and runs if you try to pet her too suddenly. She has a funny little cringing gait, with a sort of waddle in the back legs, that might be part of her timidity. Oh, and she loves cats — possibly because they don’t make sudden moves. This makes our cat Bronson very happy, as he is constantly trying to rub up against the dogs, and most won’t let him.